For the cake, preheat the oven to 180°C. Grease and line the bases of 2 cake tins (with diameters of 20cm each). Using a pestle and mortar, grind the juniper berries to a fine powder and set aside until needed. Put the cake flour, baking powder, bicarbonate of soda and salt into a bowl, and whisk to combine and remove any lumps. Place the 225g softened butter and sugar in the bowl of a stand mixer (or use an electric hand-held mixer), and beat until light and fluffy. Add the eggs and yolks, 1 at a time, beating well after each addition, then add the lime zest, 10ml (2 tsp) vanilla essence and juniper berry powder, and continue beating. Fold the butter mixture and flour mixture together, alternating additions of the flour mixture with additions of buttermilk, and mix until just combined and the buttermilk has been folded in. Divide the batter between the prepared cake tins, smoothing out the tops. Bake in the preheated oven, 35 – 45 minutes or until a skewer inserted into the centres of the cakes comes out clean. Remove from oven and allow the cakes to cool completely. While the cakes are baking and cooling down, make the icing by putting the cream cheese and 200g softened butter into the bowl of a stand mixer (or use an electric hand-held mixer). Beat briefly until smooth, then add ½ of the sifted icing sugar and beat until combined. Add the other ½ of the sifted icing sugar and the remaining ingredients, and briefly beat until just smooth. Keep the icing at room temperature. To assemble, once the cakes have cooled down, add a dollop icing to a cake plate or -stand (this will anchor the cake). Place one of the cake layers on the dollop. Sandwich the cakes together by spreading icing thickly between the layers and lightly ice the sides of the cake, keeping the icing on top of the cake a little thicker. 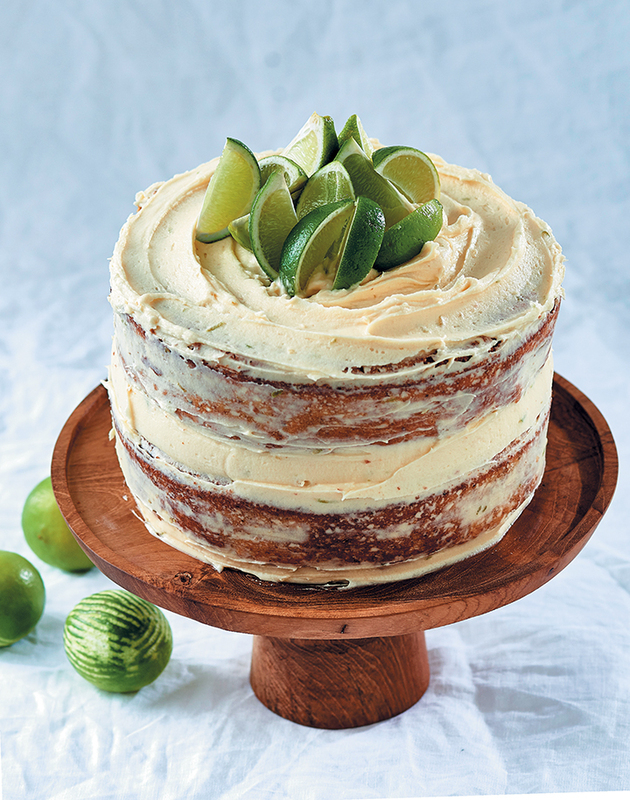 Arrange the lime wedges on top of the cake to decorate.